It was a fun filled weekend here.......well except for yesterday's baseball game that ended in the other team cheating to win and a yelling match and an almost fight.....yea that part wasn't good. The rest of the weekend pretty much rocked though! This school year is a sneaky sneakerton. I simply can not believe that we're coming into the last month of school here pretty soon. This year, especially for me, has gone by quite fast because once this school year is over our oldest will be starting (gulp) high school in the fall! I didn't think that day would be here so soon. I gave today's cocktail 5 shots out of 5. Today is super hot and when I found this Kool Aid shooter here I knew I had to give it a try. 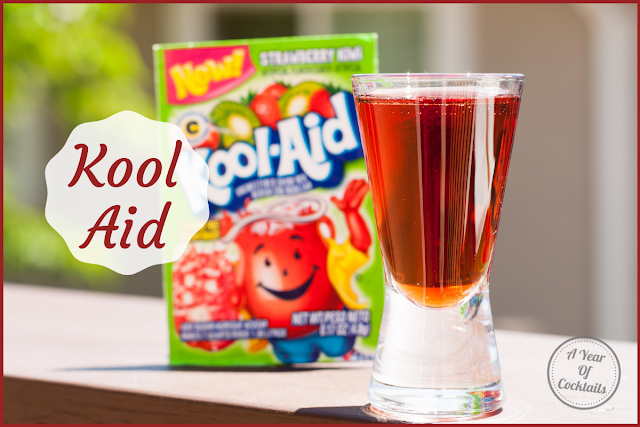 Yes I am aware that it is not the same thing as an ice cold glass of Kool Aid, but just the name was enough to reel me in. This shooter is very very smooth and easy to drink. It does not exactly taste like Kool Aid, but it really doesn't matter. The amaretto was noticeable in this shooter which for a split second reminded me of my Hawaiian Punch. Not that they taste the same, but they do remind me of each other. All in all this was a good shooter and it allowed me to use the Kool Aid packet in the photo to make a pitcher of Kool Aid as a surprise for the kids today. In a shot glass pour in your midori and amaretto. Fill the rest with cranberry juice (my shot glass was a little bigger so I was able to put in 3/4 oz). Give it a quick stir. Here's to a hot day and according to my phone, an EXTRA hot week ahead!